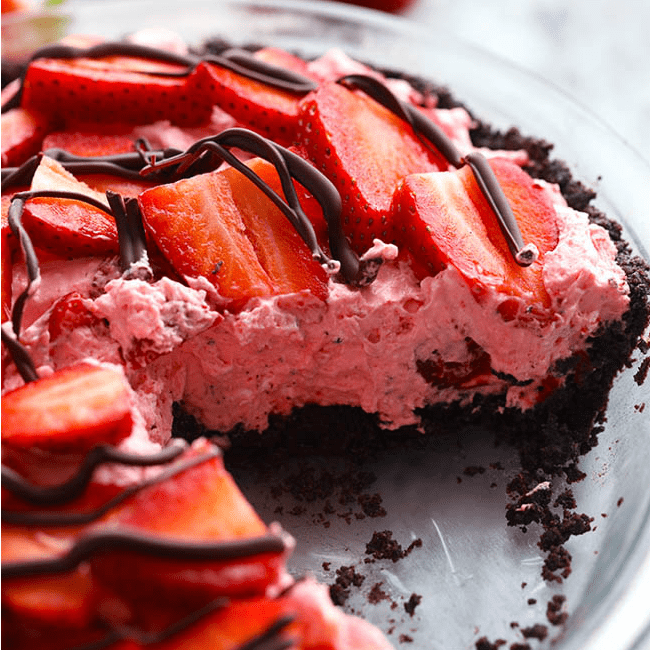 An amazing no bake pie with a chocolate crust filled with a creamy strawberry filling. 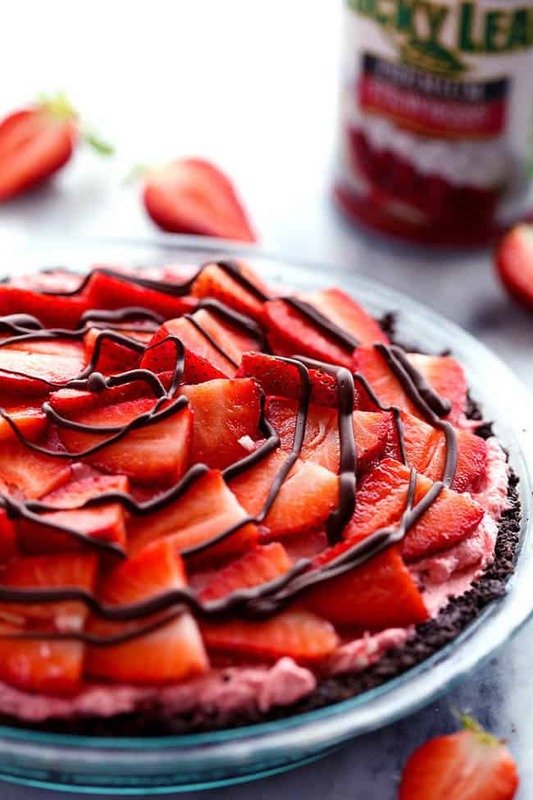 It gets topped with fresh strawberries and drizzled in chocolate and will be a huge hit wherever it goes! We are getting pretty excited for the warmer weather at our house. Last night we had our first official barbecue outside and it was so much fun! My favorite part of the warmer weather ahead is all of the berries that start coming into season. Especially strawberries. I am a strawberry fanatic. Which is why Lucky Leaf’s Strawberry Filling is one of my favorites. It is the best of its kind in my opinion and I love the plump strawberries in each and every bite! I love to take quick and easy no bake pies to gatherings. So I wanted to create a no bake pie with one of my favorite pie fillings. Chocolate and Strawberry are meant to be together right? So I made a chocolate crust and a delicious and creamy strawberry filling to go inside! 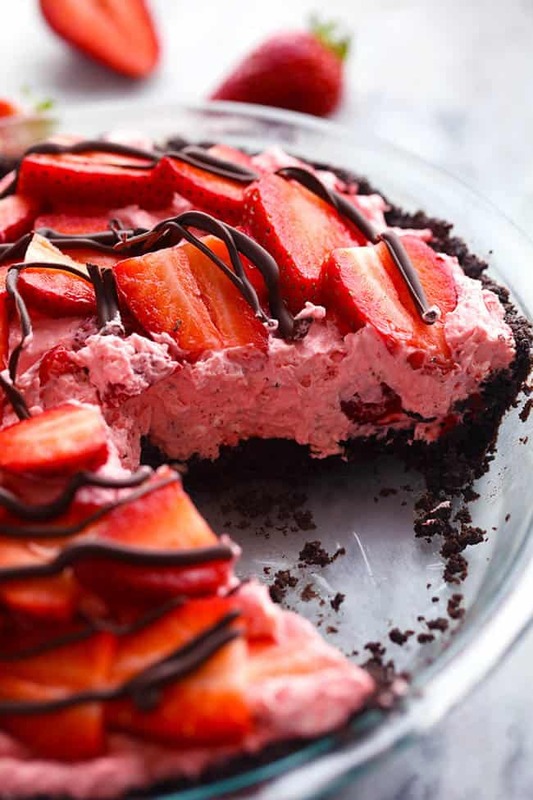 The chocolate crust was amazing but the creamy strawberry filling is hands down the best part! The creamy cheesecake is combined with the strawberry filling and gave it a fun pink color. The filling is so smooth and fluffy and I loved the strawberries hidden inside of the filling. 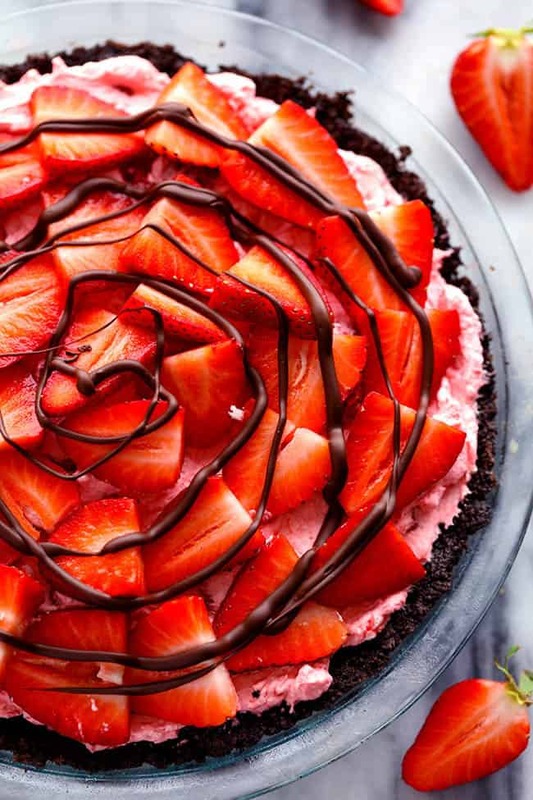 This pie gets topped with freshly sliced strawberries and drizzled with some chocolate. It is absolutely gorgeous and will be gone within a matter of minutes. We all couldn’t seem to get enough! It is easily one of the best no bake pies that I have ever had! I know you guys are going to love this pie just as much as we did! In a food processor pulse the chocolate sandwich cookies until they are fine crumbs. Add the butter and mix until incorporated and press into the bottom and sides of a 9 inch pie pan. In a medium sized bowl add the cream cheese, heavy cream and powdered sugar. Beat until the heavy cream starts to thicken and stiff peaks form. Fold in the Lucky Leaf Strawberry fruit filling. Spread on top of your chocolate pie crust. Top with fresh sliced strawberries. Refrigerate for 2 hours or until firm. To make the chocolate drizzle, melt the chocolate chips in a microwave safe bowl 30 seconds at a time and stir until smooth. Drizzle on top of strawberries and serve! Chocolate and strawberries are a beautiful combination! THAT FILLING!! This pie is absolutely gorgeous. hey girl this is right up my alley!! Yummy for my tummy! 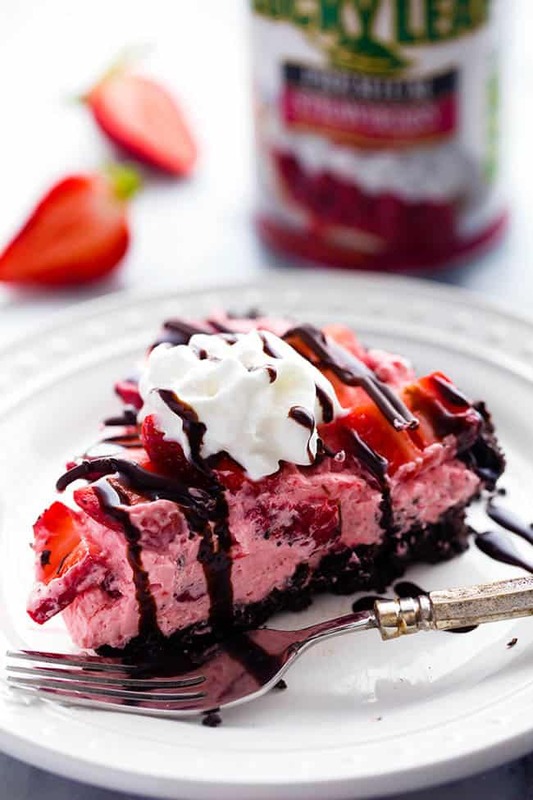 I love the combo of chocolate and strawberry, this looks stunning. Pinned! Cream cheese and heavy cream..i don’t know..can u tell me the brands u use? I use philadelpia cream cheese and I just use the store brand heavy cream. What amount of baking crumbs would be required as a substitution for the sandwich cookies.? Should cream cheese be room temp since you putting it in right away with heavy cream ? Do you take the filling out of the sandwich cookies before pulsing in the food processor or leave it in? Looks yummy! Can’t wait to try this. Can you make this a deep dish strawberry pie? And if yes how much more to add? Curious about the thickness of the filling…could it withstand a layered cake? Is this a canned strawberry pie filling? We don’t have that brand here..
You can substitute it if it is not available. This pie looks fantastic! Definitely will try this for the family! Thank you! Instead of adding strawberry fruit filling could you not just add sliced real strawberries? Like Oreos or could you use the chocolate gram crackers?